Mr. Stantz was gracious enough to allow us to record our interview session, and Exhibit 1.1 is a copy of the transcripts. 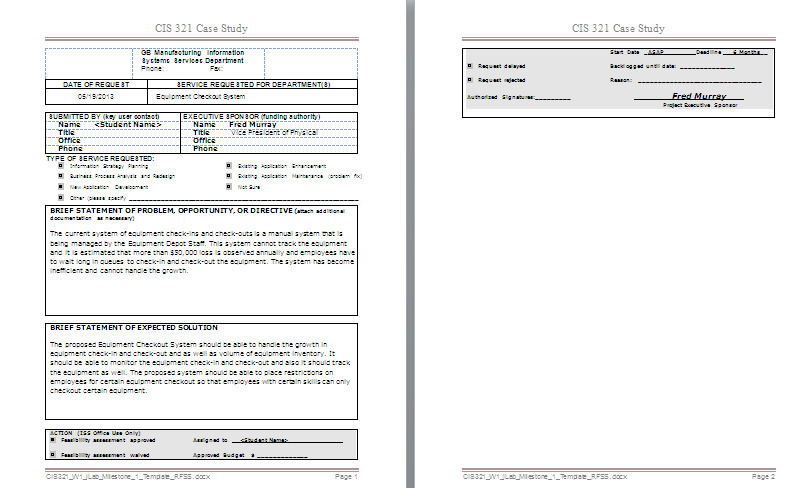 Refer to the “Case Background” above and to the interview transcript in Exhibit 1.1 for the information necessary to complete the following activities. case background. Make assumptions where necessary. Stantz and the case background for the basis of your information. Make assumptions where necessary. Place yourself in the shoes of Mr. Stantz. Which problems do you believe have the highest visibility, and how should they be ranked? Try to determine the annual benefits. State assumptions and be prepared to justify your answers! Finally, what would be your proposed solution based on the facts you know now? Deliverable format and software to be used are according to your instructor’s specifications. Deliverables should be neatly packaged in a binder, separated with a tab divider labeled “Milestone 1”. For the advanced option, prepare a Project Feasibility Assessment Report. A template for this report can be downloaded from the textbook website. 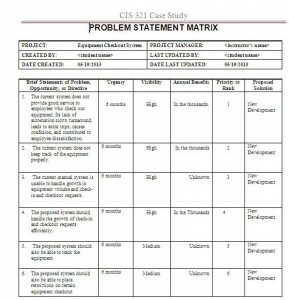 Use the information provided by the case background, the user interview, and the completed problem statement matrix. Be sure to include a Statement of Work and Gantt charts for the project schedules. Information on the Statement of Work and Gantt charts can be found in Chapter 4 of the SADM 7th ed. textbook. You have scheduled a meeting to discuss the equipment check-out project with Dan Stantz, Equipment Manager. The meeting is being held at 8:00 AM in Mr. Stantz’s office. we could both meet and discuss my project. It’s been chaotic around here. You: No problem. Hopefully this meeting won’t take too much of your time. to simply get an overall understanding of the equipment check-out project. Dan: Sounds good. Where should we begin? Dan: That’s correct, except the number one priority is the Equipment Depot operation. We would like to focus on tackling that area first. what is an Equipment Depot? if they need to replace those tools they can. Otherwise they can keep the money. You: That sounds like a sweet deal. tools. That is where the Equipment Depot comes into the picture. out from the Equipment Depot and return it when the job is completed. You: That sounds like a busy operation for the Equipment Depot staff. three and I are responsible for the Equipment Depot and its $1 million inventory. You: A million! That is a lot of hammers and screwdrivers. items that either are needed only on occasions or are too expensive to lose! percent is lost, and what percent is stolen or damaged?
. . . but no, we can’t say one way or the other for sure. You: Tell me about your current system. we no longer subcontract some of our work out to outside contractors. You:	I was about to ask about that. ins and check-outs and volume of equipment inventory. You:	So what are you envisioning for the new system? employees should have in their possession. also want the system to literally track the equipment. thing I want my people to do is purchase new equipment when they don’t have to. things you would like to discuss about the project? employees who do not possess a certain skill class to check out the equipment. way, is there a deadline that you targeted for this project, and is there a budget? You:	Good enough. I will be getting back to you soon.